The workbenches of hobbyists, hackers, and makers have become overrun with microcontrollers, computers-on-a-chip that power homebrewed video games, robots, toys, and more. In Making Things Talk, Tom Igoe, one of the creators of Arduino, shows how to make these gadgets talk. 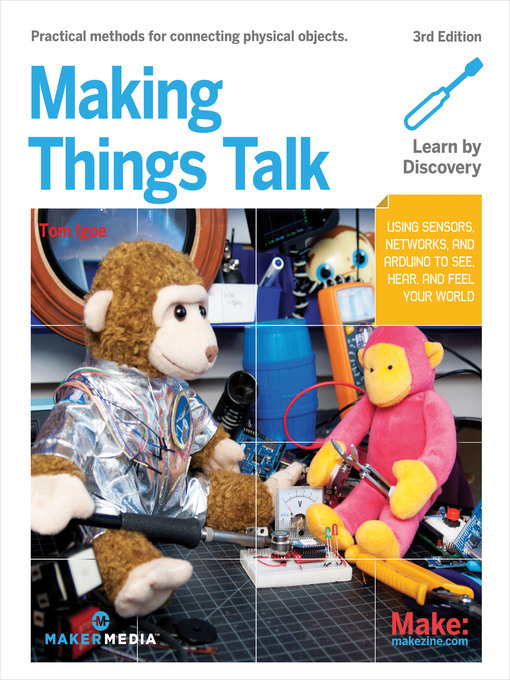 Whether you need to connect some sensors to the Internet or create a device that can interact wirelessly with other creations, this book shows you what you need. Although they are powerful, the projects in this book are inexpensive to build: the Arduino microcontroller board itself ranges from around $25 to $40. The networking hardware covered here includes Ethernet, Wi-Fi, Bluetooth, and can be had for $25 to $50. Fully updated for the latest Arduino hardware and software, this book lets you combine microcontrollers, sensors, and networking hardware to make things... and make them talk to each other!